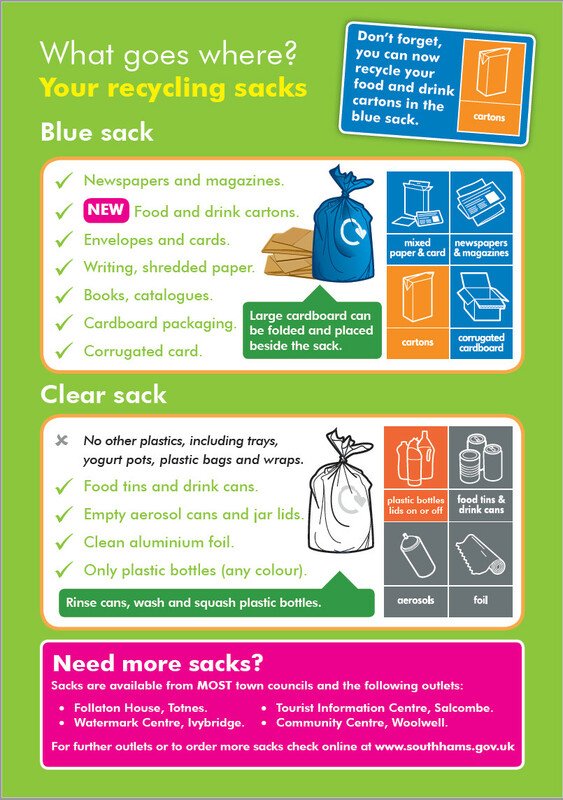 Clear Sacks, Blue Sacks and the Brown Wheely Bin are collected on the same day in one week. 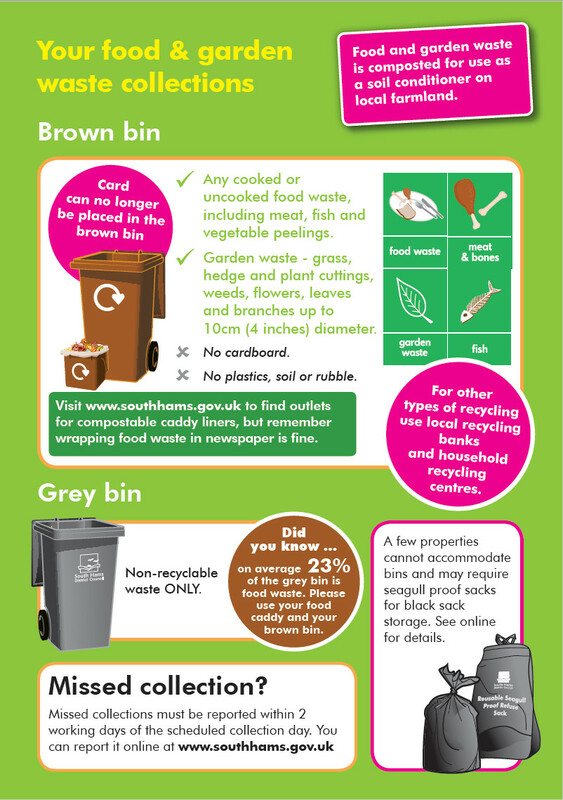 Non-Recyclable waste in the Grey Wheely Bin is collected the next week. 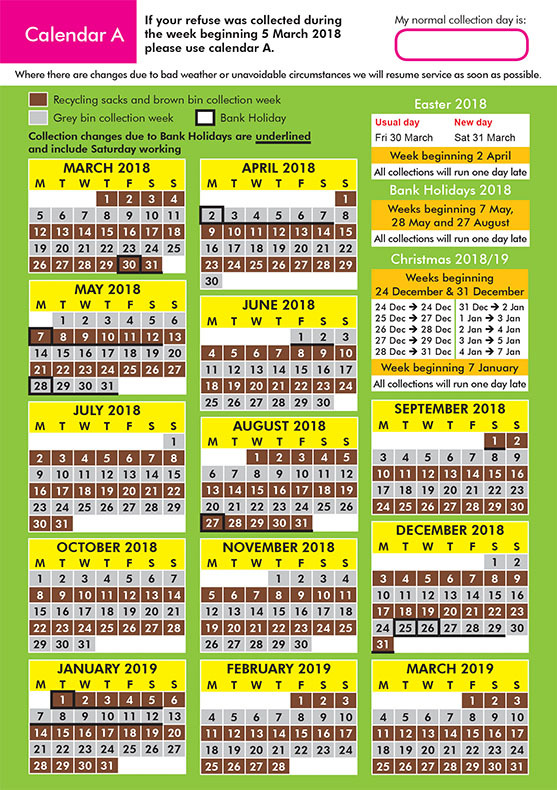 IN OTHER WORDS, EACH COLLECTION DATE IS A TWO WEEK CYCLE. Extra rolls of Clear & Blue Plastic Bags can be requested from the pick-up trucks directly, through the SHDC website (see link at bottom of page), or by emailing waste@swdevon.gov.uk. PUTTING CLEAR OR BLUE PLASTIC BAGS OUT EARLIER THAN THE NIGHT BEFORE THE MORNING PICKUP IS NOT A GOOD IDEA AS THEY BLOW ABOUT IN THE WIND MAKING AN UNSIGHTLY MESS IN THE VILLAGE ROADS AND FOR YOUR NEIGHBOURS. 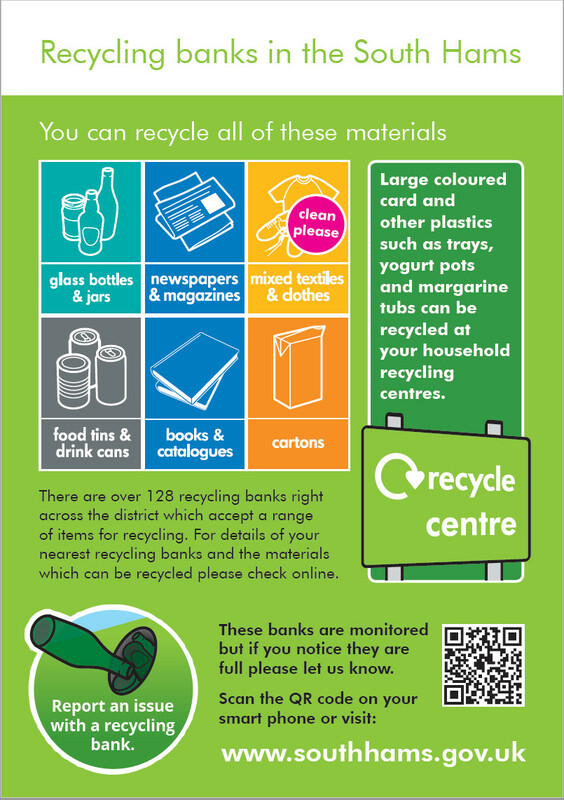 ​Glass is not collected, nor a box supplied, so must be taken to Local Bottle Banks in your own box. Cattle Market Car Park, Rope Walk Road, Kingsbridge (back of the Tone Sports Centre). 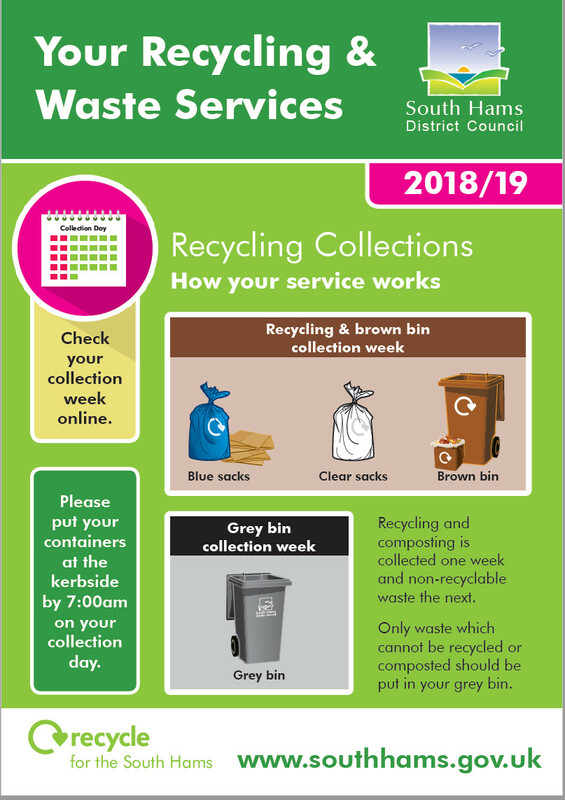 Below is how your household rubbish must be sorted and the Collection dates for the two week cycle collection schedule. (If out of date see SHDC link below). Calendar A applies to all properties in Thurlestone, Bantham and Buckland. 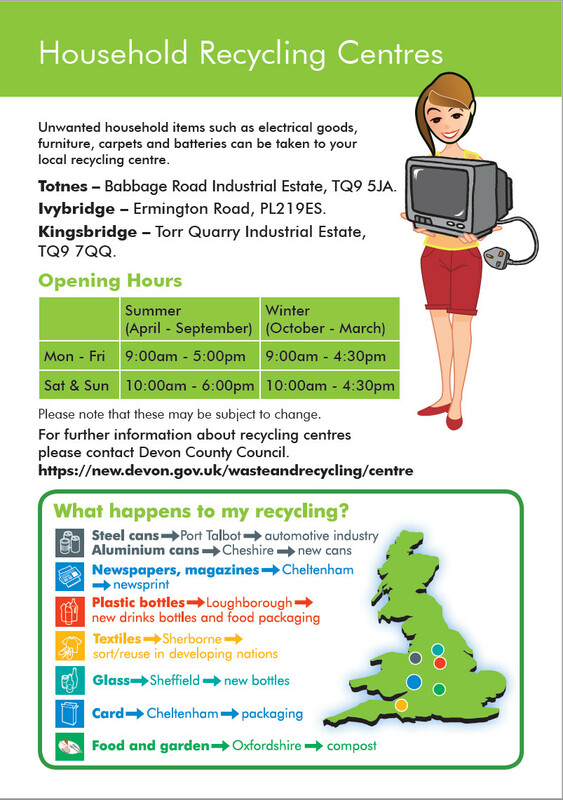 ​﻿﻿﻿​Other Household Waste to be disposed of will have to be taken to Torr Quarry Recycling Centre off the A381, near Stumpy Cross roundabout, at postcode TQ9 7QQ. 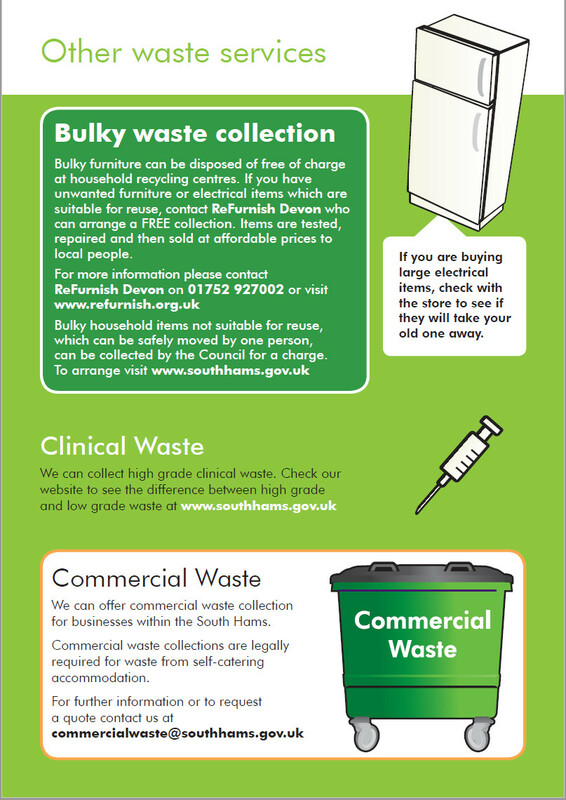 Did you know you can report fly tipping, dog fouling, overflowing or damaged bins, issues with recycling banks, abandoned cars, dead animals etc all from the "Report It" page on the South Hams website? Use the button on the right to go straight to the page. Another outlet for unwanted usable items are charity shops of which there are many in Kingsbridge. The Country Hill Animal Shelter is the only one that takes electrical goods and will pick up large items for free.